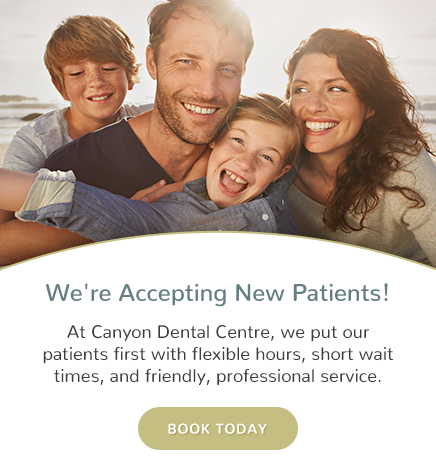 Dental bridges are teeth replacement options available at Canyon Dental Centre in North Vancouver. Bridges replace one or more missing teeth making it easier to chew and also enhance the appearance. Bridges are commonly used to replace one or more missing teeth. They span the space where the teeth are missing. Bridges are cemented to the natural teeth or implants surrounding the empty space. These teeth, called abutments, serve as anchors for the bridge. Your dentist can help you decide which to use, based on the location of the missing tooth (or teeth), its function, aesthetic considerations and cost. Porcelain or ceramic bridges can be matched to the colour of your natural teeth. Before either a crown or a bridge can be made, the tooth (or teeth) may be reduced in size so that the crown or bridge will fit over it properly like a thimble fitting over a peg. After reducing the tooth/teeth, your dentist will take an impression to provide an exact mould for the bridge. If porcelain is to be used, your dentist will determine the correct shade for the crown or bridge to match the colour of your existing teeth. NOTE: Your dentist may recommend implants as a means of replacing missing teeth. Implants can replace missing teeth without the need to touch or restore adjacent teeth next to space. Please refer to the section on Dental Implants.